Say it with me – it’s not the pitching’s fault. Though it’s fashionable in Rockieville to blame the pitching, the Rockies’ pitching staff, led by Ubaldo Jimenez, was actually at the top of the WAR leaderboards for the second consecutive season last year. When you take into account how difficult Coors Field is to pitch in, Rockies pitchers often come out looking rosy. Since their inception, their combined pitching WAR of 322.7 ranks 6th in all of baseball, but the past two seasons have been especially exceptional. Unfortunately, the same can’t be said for the offense. If the offense turns around, 2011 could see the return of Rocktober. If you were looking for a definition of a stars and scrubs lineup, this would be as good an example as any. Troy Tulowitzki and Carlos Gonzalez ranked 10th and 16th in position player WAR last season, but no one else on the 2011 roster even reached the average threshold of 2.0. But this doesn’t have to be a stars and scrubs lineup. The homegrown quartet of Dexter Fowler, Seth Smith, Ian Stewart and Chris Iannetta has shown flashes in the past. If the Rockies are to succeed, they’ll have to extend those flashes and become at least average contributors, as offensive improvement is not likely to come elsewhere. Lopez and Wigginton are forecasted for very mild rebounds from their 2010 totals, but neither is likely to overwhelmingly surpass their predecessors. Looking at the lineup, it’s not dominated by one handed-ness overall, but it is in its configuration. By batting Jose Lopez and Chris Iannetta seventh and eighth, it means that there will only be one right-handed batter from two through six. Translation – there will be tinkering afoot, especially against left-handed starters. Last season, manager Jim Tracy used 135 different batting orders (not counting pitchers) – only the Red Sox (143) and Indians (142) used more. Last season, Colorado got three top fifty seasons (per WAR) from Jimenez, Jason Hammel and Jhoulys Chacin. Chacin’s 3.0 WAR was particularly impressive, since he accumulated it in so few innings pitched. Of those ahead of him on the 2010 pitching WAR leaderboard, only Carlos Marmol had fewer innings pitched. While Jimenez is unlikely to duplicate the season he had a year ago, full seasons from Chacin and Jorge De La Rosa should offset that. And while the infield defense figures to suffer with the defection of Barmes, who was easily the team’s second best defender after Tulowitzki, the Rockies should still have a solid to great front four. The one battle that could emerge in camp is the one for fifth starter. Whether Aaron Cook or Felipe Paulino starts the season in the rotation, both are likely to see action there as the season progresses (Esmil Rogers may factor in here as well). While Cook’s comeback in 2006 is still something to marvel at, the ground ball machine has only thrown 200 innings once in the past four seasons, and with him already experiencing shoulder soreness early in camp, this year doesn’t figure to be any different. Paulino has a heavy fastball – of those with at least 90 innings pitched last season, only Jimenez’s had more zip – and his 2010 FIP was a shiny 3.44 FIP, but he still needs to get his walk totals down and his ground balls up. When it comes to Huston Street, the main concern is whether or not he’ll be ready to take the bump. In his two seasons with the Rockies, he has generated FIP’s of 2.93 and 3.37 – not his best work, but solid nonetheless. Elsewhere, the pen is stocked. Matt Belisle was great throughout 2010, and Rafael Betancourt the same following a rough start. These three will be responsible for the late inning work. Tracy doesn’t usually play matchups with Street, something Rockies fans learned the hard way during Game 4 of the ’09 NLDS. Like Street, Betancourt is much more effective against righties, but Belisle hasn’t shown a drastic platoon split in his time in Colorado. This could prove pivotal, as the loss of Joe Beimel to free agency means that the Rockies only lefty relievers are the unproven Matt Reynolds and the shaky Franklin Morales. Reynolds – the only player the Rockies have graduated from the last four drafts – impressed in late-season work, and could push Morales permanently to the fringes this season. Playing the futures game, Christian Friedrich, Rex Brothers and maybe, just maybe, Casey Weathers, are candidates to give the bullpen a late-season shot in the arm. The Rockies are counting on Iannetta more than ever this season, but if he falters, Michael McKenry, Jose Morales, Jordan Pacheco and Wilin Rosario are all waiting in the wings. The same goes for Stewart, as some combination of Herrera, Lopez, Chris Nelson, Wigginton and/or Eric Young, Jr. can contribute at third. But there’s no such depth in center field. Now that he’s going to be a Rockie for a long time, Tracy has made it clear that he wants Gonzalez strictly in left. This leaves the Rockies with one center fielder on the 40-man roster – Fowler. The Rockies only plan B if Fowler is ineffective or hurt this season may be Charlie Blackmon, and many question whether or not he can handle center defensively. Even Fowler, who drew raves for his defense in the Minors, needed time to adjust to Colorado’s vast center field. Last season, Fowler’s WAR jumped from 0.3 to 1.7, and just about all of that was in his UZR, which improved by 13.6 runs. Now near average defensively – the Fans Scouting Report ranked him the 13th best center fielder last season – Fowler needs to consolidate those gains and focus on improving at the plate. Fowler pounces when he gets ahead in the count, and has been excellent in full count situations as well. But his OBP is a dreadful .221 when he falls behind 0-2, and .228 when he falls behind 1-2, as he is frequently fooled by sliders and changeups, which leaves him prey to quick punch outs. He cut his strike out percentage slightly last season – from 26.8% in ’09 to 23.7% a year ago – and will need better pitch recognition to do so again in 2011. 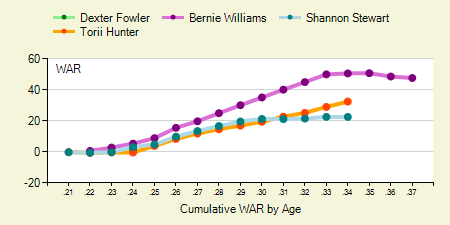 If he does, Stewart’s career (don’t scoff, Stewart had five seasons of 3+ WAR) may be his floor, but it’s time for Fowler to start showing that progress. The Rockies won 83 games last season, but could – and perhaps should – have won six to eight games more. Retaining De La Rosa created depth at the back of the rotation, and the bullpen is so stocked that a guy who threw 50 innings back in 2009 will have to fight to make the squad this season. The defense, the quality of which varies depending on your metric of choice, figures to drop off some but not reach “achilles heel” territory. As a result, it’s the offense that will determine the fate of the 2011 Rockies. With essentially the same lineup as last season, the Rockies have no choice but to improve from within. If they don’t, stiff competition from San Francisco, Atlanta and whoever loses the Cincinnati-Milwaukee duel could squeeze the Rockies out of the playoff picture again in 2011. We hoped you liked reading Team Preview: Colorado Rockies by Paul Swydan! “it’s fashionable in Rockieville to blame the pitching” – not true. It’s fashionable OUTSIDE rockieville to blame the pitching. We’ve been lamenting the whole “batters at Coors aren’t as good as they look yet somehow pitchers sren’t considered better than they look” for years now.